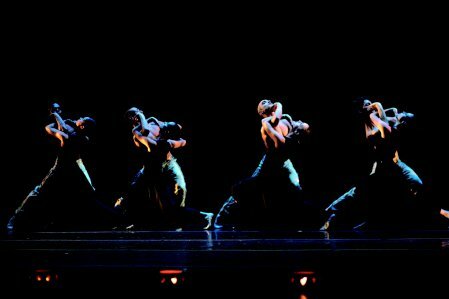 It always comes as a pleasant surprise when a visiting dance company that I’ve not previously seen brings with it a plethora of highly competent dancers, as well as a program that shows them off. While I did not find the four pieces on São Paulo Dance Company’s program at the opening performance of its run at the Joyce Theater to be at a particularly high choreographic level, the dancers are. Their training in – and facility with – ballet technique, as well as in contemporary dance, is apparent. And it’s refreshing that the company, which uses the acronym SPCD (from its name in Portuguese), chose to bring with it all 23 of its dancers – this program is designed to provide a relatively comprehensive introduction, not an obscure sampling. The four dances that SPCD Artistic Director Inês Bogéa chose to present for its initial North American tour represent a diverse assortment of pieces by three Brazilian choreographers who are relatively unfamiliar here: Cassi Abranches, Clébio Oliveira, and Jomar Mesquita, as well as one by the ubiquitous Spanish choreographer, Nacho Duato. Each piece is thoroughly distinctive choreographically from the other. Cassi Abranches’s Gen, created at the 2014 SPCD Choreographers Workshop, shows promise, but falls prey to mistakes typically made in early choreographic efforts. Abranches indicates in program notes that her piece draws from her transformation from being a dancer (she danced with Grupo Corpo , the Brazilian company with which Bogéa also danced) to being a choreographer, and is intended to reflect the creative process for people of a new generation – which presumably explains where ”Gen” comes from. While that is certainly a fair subject for an early choreographic effort, Abranches here is too enamored of her own style, and her overuse of movement that’s both slinky and twitchy, backward motion, and lifts that require the men to reach up from behind the women and grab and then manipulate them with their hands spreading across the women’s upper chests from under their armpits, became increasingly annoying. That being said, the piece is structurally interesting, inventively staged, and moves to a distinctive pulse – and it provided a fair introduction to the company’s dancers. Céu Cinzento (“Gray Skies”), another piece created for the SPCD Choreographers Workshop (for 2015), examines what the choreographer calls “impossible love,” as in Romeo and Juliet, but in an outrageously unique way. Instead of being doomed by the accident of their birth to feuding families, the lovers in Céu Cinzento are doomed by their blindness. On a darkened stage, the pair – Luiza Yuk and Vinícius Vieira – are introduced individually. Initially, they act as if imprisoned in their own worlds, with Yuk alternatingly moving hesitantly and flailing in different directions at once and Vieira appearing more purposeful, until they ‘discover’ each other and their relationship brightens the surrounding sky (and stage). But it wasn’t apparent to me that they were supposed to be blind; in fact (I must concede that I did not read Oliveira’s program notes until after I’d seen the duet), it appeared to me that the difficulty seeing was a metaphor for the pair being confronted by, and confined by, forces beyond their control. Be that as it may, with the knowledge of program notes and hindsight, I can see that the stage action is consistent with portraying two people who cannot. Indeed, my notes also reflect that Yuk’s physical appearance and body positioning on stage resembled images I can recall of a young Helen Keller from The Miracle Worker. But to me this fact, combined with the stage action, makes the situation, and the proposition that this is someway akin to the hopeless love of Romeo and Juliet, all the more ludicrous. Oliveira appears to be saying that their relationship is doomed solely because of their blindness – and that’s a premise I find difficult to accept unless you also accept that the pair live in a world in which only they exist. And Oliveira’s final image – of Vieira pushing Yuk across the stage as if she were a log – makes no sense either, unless you accept either that the two characters became separated and he can no longer distinguish her from a block of wood, or that Vieira’s character has decided that their relationship is impossible (or that it was his intention from the beginning to make it transitory) and that she’s effectively dead to him as he trudges off into his life of perpetual darkness. But I’m being overly analytical here, as I tend to be when I’m intellectually engaged – which is a positive reaction to any dance. Whether Céu Cinzento is a fair depiction of the sort of doomed love that was Romeo and Juliet isn’t really the point. The choreography is interesting and unusual, and the performances by Vieira, and particularly by Yuk, were fabulous. It’s easy to conclude that Mamihlapinatapai is merely an agglomeration of clichés about love’s mystery, and its universality, that isn’t worth more than passing interest. But I found it intriguing. Essentially, Mesquita (with collaboration from Rodrigo de Castro), to pieced-together but coherent music culled from a variety of compositions, explores what he describes as the “look shared by two people, each one wishing the other to make the move to make something happen,” but nothing works. Mamihlapinatapai is the word in the indigenous language of Yaphank, from the tribe of Tierra del Fuego, which purportedly means what I’ve just described. If you’ll forgive the Sergio Mendes and Brasil 66 allusion, it might also be described as “the look of love” – that is, before much else happens except anticipatory fulfillment. Mesquita has the piece’s four couples dance in pairs, and also as a group. The duets (which, given Mesquita’s description, I take to be expressing wishful thinking) are interestingly choreographed and distinct from each other – it’s not all limited to staring yearningly into each other’s eyes. Only when the couples position themselves in a group circle of apparent puzzlement that the choreography, such as it is, descends to….looking into each other’s eyes. Keeping the dancers’ identities straight proved challenging – but the women (Leticia Martins, Michelle Molina, Pamela Valim, and Renata Alencar) made a far stronger impression than the men. Nacho Duato choreographed Gnawa for Hubbard Street Dance Chicago in 2005, and Hubbard Street presented it at the Joyce last year. Although there’s a sameness quality to the mass movement in many of Duato’s pieces, this one, fueled by Middle-Eastern sounds and mysticism, I found fascinating and compelling last year, and still do. The SPCD dancers delivered a superb performance, highlighted by those of Ammanda Rosa, Ana Roberta Teixeira, and Andre Grippi. São Paulo Dance Company has a stellar reputation in Brazil. While the program it brought to this Joyce engagement isn’t top flight, it’s different. More importantly, it evidences a company of significant quality. The company merits more consistent exposure in the future.